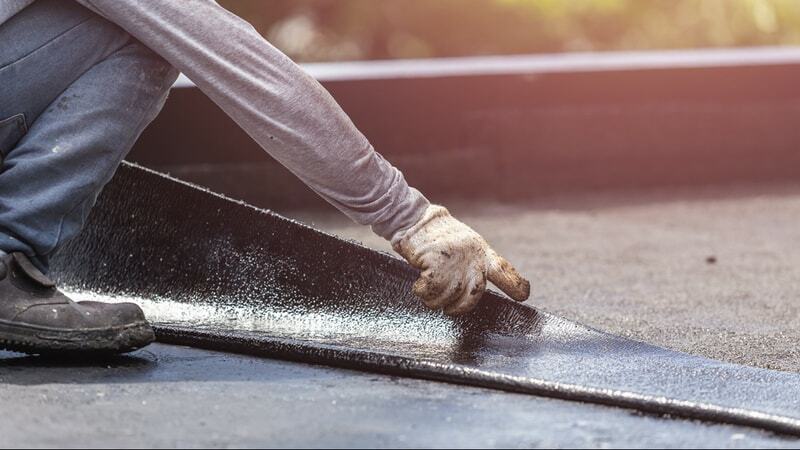 Flat Roof Leak Repair: Should You Really DIY? Learn More Here! Flat roofs are a popular choice for modern homes and commercial buildings, but they can be prone to leaks. That said, knowing some of the details that go into patching up a leaking roof can go a long way into extending its lifespan. From identifying the signs of a leaking roof to finding the source of the leak and fixing the leak itself, there are many things you can do to maximize your investment. To understand what we’re working with, let’s briefly discuss how a flat roofing system works. A flat roof isn’t exactly flat, but it has a nearly horizontal surface–unlike a pitched roof. A roof, after all, needs a slope to be able to shed rainwater and have a working drainage system. Roofs with a slope less than 2.5/12 are considered flat. For most homeowners, a roof leak is the furthest thing from their mind. But when it happens? It’s something that’s difficult to ignore. It’s not exactly relaxing to hear the constant dripping of water inside the kitchen, even more so when your home’s interior is a bucket away from getting flooded. It’s not difficult to see why roof leaks should be a priority among homeowners. 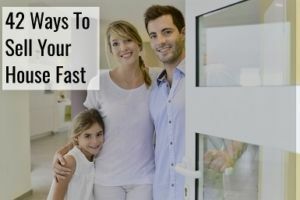 For one thing, they cause so many potential problems inside the home that could get worse if left unattended, which could lead to higher repair costs. Here are the common issues caused by roof leaks. Roof leaks are notorious for causing a home’s structural damage. As soon as rainwater enters the attic, moisture can spread along the underside of the roof deck until it takes over the framing. This results in water damage. Soon enough the moisture causes your home’s foundations to rot and warp, compromising your home’s structural integrity. Even a single leak can result in structural damage, although it takes a few years to become noticeable. The problem with single leaks is that they are extremely hard to detect. And once you do it might already be too late. When water invades your attic during a roof leak, the moisture can soak your insulation, thus reducing its efficiency and causing it to deteriorate. Warm air starts to escape through the vents, causing your heater to kick into high gear, which in turn causes your electricity bill to go up. There’s always the risk of water getting in contact with electrical wiring and electrical circuit when the roof is leaking, which can result in fire and electrical hazard. The risk becomes even more pronounced when there are gaps in the insulation. There’s also the danger of moisture entering your electrical boxes, which could electrocute anyone who comes into contact with it. As soon as you notice signs of a leak, switch off the circuit connected to the affected area and call an electrician for help. This is not something you can DIY. Any area exposed to water is a potential breeding ground for mold. If moisture starts penetrating your home’s foundations then you could have a big problem. Worse, mold growth can negatively impact your health as well. Mold, which can spread through the air, can result in respiratory issues, including nasal stuffiness, throat irritation, coughing, wheezing, and more. You need to get rid of mold before it turns into black mold. Black mold’s health risks are more severe than regular mold. Puddles on the floor caused by water leaks are accidents waiting to happen. It’s imperative that you mop those puddles away as soon as possible to keep your home safe. You wouldn’t want standing water in any part of your house if you have children running around. While flat roofs are prone to leaks, the truth is that these issues could have been avoided if homeowners only do their part. Flat roofs usually last between 10 to 15 years, but with regular inspections and proper maintenance, you can extend their shelf-life to 20 or even 30 years. Below are the most common types of flat roofs including their most notable characteristics. EPDM (Ethylene Propylene Diene Monomer) is known for its flexibility, long shelf-life, and affordable price. Made of synthetic rubber, EPDM has high-tensile strength, making it resistant to tears and abrasions. Out of all flat roof types, it’s also one of the easiest to install. One major disadvantage of EPDM is that its seams are prone to leaks and damages. When these seams crack, pull up, or get frayed, it won’t take much for water to penetrate the home’s attic. Thankfully, seams can be fixed right away using adhesives, although patching them up on a regular basis can be a source of great irritation for many homeowners. Built-up roofs, also called BUR, has been a popular roofing choice in the U.S. for over 100 years, and for many good reasons. 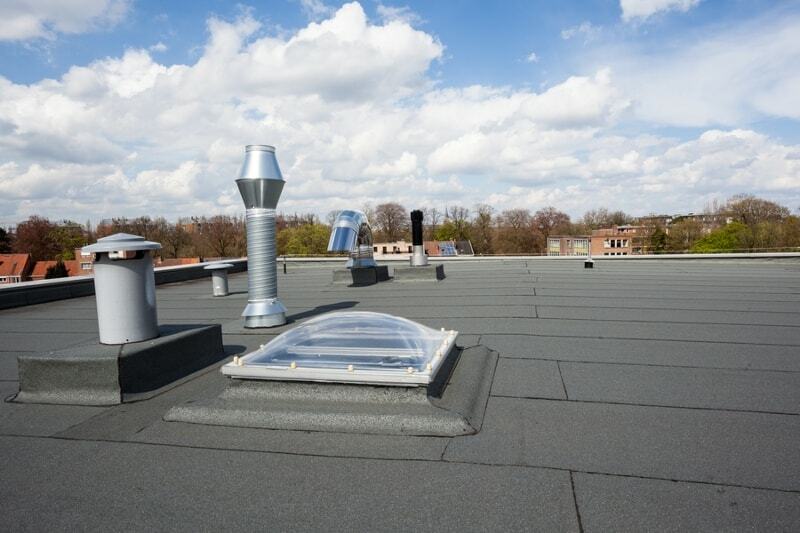 These roofing systems are made of a reinforced membrane composed of bitumen and roofing felts. Some built-up roofs are reinforced with fiberglass mats or organic mats, mostly at a standard width of 36 inches. Built-up roofing systems have a shelf-life of 20-30 years but could last even longer in warmer climates. Built-Up roofs are relatively more resistant to leaks and inclement weather, though they are a nightmare to install and maintain. Modified bitumen roofing is nearly similar to built-up roofs except that they are more asphalt-based. Compact and durable, modified bitumen roofs are a popular choice for commercial buildings, although they are a great high-performance alternative for residential homes as well. Strong as modified bitumen roofs are, they are not built to last. 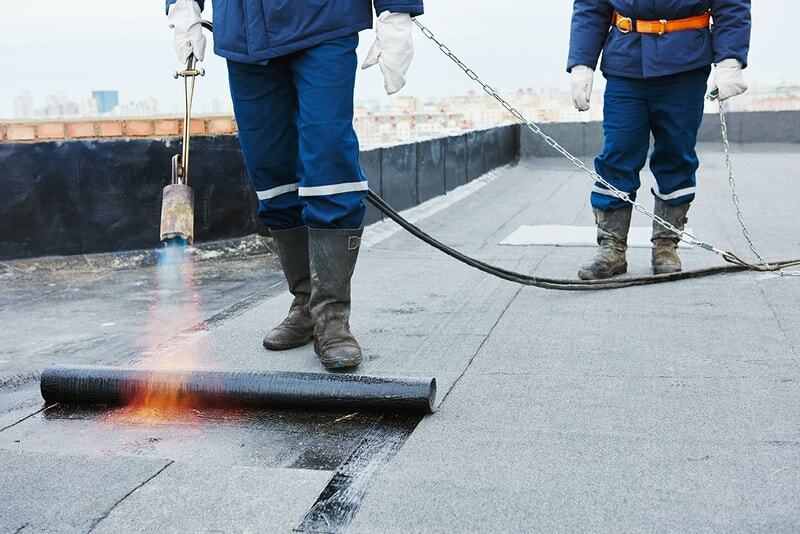 At best, modified bitumen roofing can last around 20 years, maybe even more with regular treatment and maintenance. Leaks in modified bitumen roofs are mostly caused by seam failure. Spray Polyurethane Foam (SPF) roofing is built to last on account of its reinforced polyurethane material and high R-value coating. Thanks to its seamless composition, SPF roofing is highly resistant to severe weather. One drawback with SPF roofing is that they require regular maintenance– at least twice a year. Thermoplastic roofing systems are made of single-layered membranes installed either through adhesives or via screws and plates. There are many types of thermoplastic roofing but TPO (thermoplastic polyolefin) is perhaps the most popular. TPO’s seams are welded together instead of glued, making it highly resistant to severe weather. Its white surface can also reflect ultraviolet right, minimizing the risk of solar damage. It’s more difficult to locate a leak in a flat roof instead of a sloped one. For one thing, it’s hard to tell which direction the water will go once it penetrates the roof. This is why it can be tricky to find the leak source relative to the location of the drip. Locating a roof leak in a flat roof can be difficult, but not impossible if you follow the steps below, although it should preferably be done by a pro for safety. Get up on the roof using a ladder when it’s dry and cool outside. Remove any debris that might be hiding leak spots. Examine the roof flashing connecting your roof to the chimney, plumbing stack, or other holes in the roof. Are the flashing materials secure? Look for cracks, signs of rot, or gaps where water can easily penetrate. Check out for any signs of cracking or rot on the flange surrounding the plumbing vents. The flange is supposed to protect the roof opening so any irregularities could cause leaks. Are there temporary patches made of tar or caulking on the roof? If so, these patches may have overstayed their welcome. Examine the seams along the roofing material for any gaps or loose edges. Are the seams securely attached? Look for low spots on the roof where ponding can occur. Remember, standing water can cause damage to your roof over time. Low spots usually leave concentric marks when filled with water. Check the center of these marks for damages. The common issue with flat roofs is that their drainage system is not as efficient as that of a pitched roof. For one thing, the water doesn’t run off the way it does on a sloped roof. The National Roofing Contractors Association categorically stated that standing water starts to become a problem after 48 hours. Which means you have 2 days to get rid of standing water as soon as the rain starts. Allow the water to just stand there for a long time and you run the risk of your roof getting damaged by the accumulated pressure. When water damage strikes, structural issues could impact your home’s foundations, drywalls, furniture, and many other things. So what should one do once water damage has occurred? The first order of business, of course, is to get rid of the water. After all, you don’t want the damage to get worse. Without getting rid of the water, it can be extremely difficult how to spot the source of the leak, much less repair the damages they have caused. It’s important to keep in mind that the location of the drip is not always directly above the source of the roof leak. The water will always take the path of least resistance until it finds an opening. This is where the drip will occur. After spotting the drip, place a bucket under it to keep the water from spreading and causing further damage. If the water is dripping on the ceiling, grab a pencil and use it to create a small hole in the drip. With this done, put a bucket under it to stop the water from flooding the attic. If possible, go into the attic so you can spot exactly where the leak is coming from. Depending on the structure of your attic and roof, it can be difficult to find where the water is getting in, but it helps to examine openings near the vents or the chimney. Once you’ve spotted the source of the leak, put the bucket under it. Patching it up with roof tape or cement should serve as a temporary solution until you’re able to seek professional assistance. You can always go directly on top of the roof so you can put a tarp or tarpaulin over the leak. Obviously, this is just a temporary solution. The goal, for now, is to prevent the water from causing any more damage. The steps above should at least mitigate the damages caused by a roof leak. But as expressed earlier, these are but temporary fixes. To ensure that your home is safe from water damage and its devastating effects, seek the help of a professional roofer. Also, give a restoration specialist to get rid of the water and ensure that all necessary precautions are taken to prevent them from spreading further. Roof inspections are obviously important if you want to maximize your roof investment, but they are even more necessary when you’re using a flat roof. As mentioned numerous times in this article, flat roofs are a nightmare waiting to happen if you don’t keep them well-maintained. In fact, it’s recommended that they are inspected at least every two years, especially during the spring and autumn months, since those are the times of the year where rains and storms are most frequent. Since they don’t have much slope, flat roofs are prone to standing water or pooling, which is the main reason why flat roofs require a lot of treatment and maintenance. This standing water imposes pressure on the roof, which could lead to roof damage. The moment you notice any sign of damages on your flat roof, it’s advised that you find a professional contractor who can make the necessary fixes. If you allow your flat roof to receive constant abuse from standing water, chances are you’re going to spend a heftier amount for repairs. Overall, the average cost to repair a flat roof falls between $300 to $500. Repairing a flat roof is no easy task. 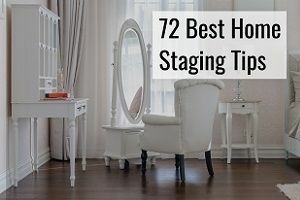 Not only does it require you to spend some hard-earned cash, but it also requires time and effort on your part. Of course, the degree of commitment required for such an endeavor depends on the severity of the roof’s damages. Also, it pays to know beforehand what you’re getting yourself into. By getting familiar with the costs involved, you’ll know the preparations needed in terms of budget, time, and personal involvement. Understanding the costs also lets you know which questions you need to ask to ensure that the project is completed according to your preferences. So, without further ado, here are the essential considerations that go into roof repairs. In most cases, the best way to repair a piece of roof is to do an all-out replacement. You have two choices in this scenario: To replace the damaged area or to replace the entire roof altogether. If it’s the former, it makes sense to purchase materials that are similar to the ones surrounding the affected area. The latter option makes sense if your flat roof is old or if you want to use a different material. Either way, you need to take into account the pricing of each material to get a fairly accurate estimate of the overall costs. Here are the different types of materials for flat roofs and their corresponding costs per square foot. If your flat roof’s interiors have been damaged in some way, you have to take into account the costs of the painting job and sheet-rock replacements. Cost of interior repairs may cost between $250 and $400. It’s not always easy to spot the source of a leaking roof. It could be a loose seam or a gap in one of the seams. There may even be more than one leak. If the roof has been experiencing water damage for a while, it may be necessary to check if there’s further damage to the roof or to the interior of your property. Each type of flat roof might call for a different approach when it comes to repairs. An EPDM rubber roof, for instance, is very easy to repair, not requiring much in terms of manual labor. Concrete roofs, on the other hand, are a nightmare to work with, especially when it comes to finding the source of a leak. There are many variables at play in what makes a flat roof repair job cheap or expensive, but it’s important to discuss with your roofing contractor your best options depending on the budget you’ve allocated for the repair job. Before hiring a roofing contractor, check with your local municipality if you need someone with a license. That said, it’s always better to hire a contractor who has earned one. For one thing, a licensed roofer has a general liability and workers compensation insurance that will cover the expenses in case an accident occurs during the course of the project. A licensed contractor also provides the assurance that the repair job is done with the utmost care and with proper procedures in place. Your flat roof is leaking, and because you’re used to doing things on your own, you decide to fix it yourself. After all, watching a few instructional videos on YouTube should tell you everything you need, right? Months later your roof is leaking again. So, what gives? Upon checking the roof (on your own again) and doing more extensive research on the web, you realize that epoxy-based coating is not recommended, or that the pop end shouldn’t be placed adjacent to the ventilator, or that roofing tar is not watertight enough, and so on. You get the picture. Here’s the point: Roofing is a complicated process, so much so that there’s a lot of room for mistakes. Do you want your flat roof fixed without wasting time and money? Hire a professional roofer instead. Here are the top reasons why hiring a professional contractor is always the better choice. If you want professional-quality work, you have to let the professionals do it. Roofing contractors, after all, have the expertise, the tools, and the discipline to ensure that the repair job is done according to industry standards. Remember, these professionals didn’t earn their license for nothing. Having received the type of education and training approved by the state or local board, professional roofers give you the peace of mind knowing that your flat roof will be as good as new once they’re done working on it. 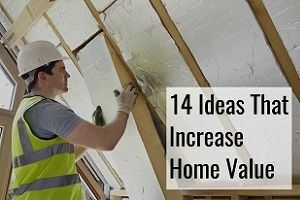 Most people think going DIY will save them more money. That can’t be further from the truth. Sure, hiring the “friend of a friend” might cost you less in terms of manual labor. At least the first time. But in the end? You might realize that the job is not to your liking and you’d end up having your roof fixed again. Besides, a professional roofer gets discounts when buying roofing materials since they have the authorization to buy them at a wholesale price. A certified roofer will offer you some form of warranty, providing you the assurance that they’ll be fulfilling their end of the bargain as is stated on the contract throughout the entirety of the project. Fixing a roof comes with its attendant risks. If an uncertified roofer hurts himself while performing the job on your property, you’ll be obligated by law to pay for the damages. And yes, you still need to pay up even if it’s the roofer’s own fault. By hiring a certified contractor with a certificate of insurance, you’re always protected from such financial responsibility. Should you replace a flat roof instead? Flat roofs, no matter how well-maintained, get worn out in the end. A minor leak? You can get it fixed in no time. Want to give it a design upgrade? Why not? That said, flat roofs have a lifespan and there will come a day when you have no choice but to have it replaced. The only question is when. Replacing a flat roof, or any roof for that matter, requires commitment. So make sure that you decide to do it only as a last resort. Bear in mind, however, that it’s always better to consult a professional roofing contractor first before making a final decision. They’re the experts, after all, and you can only benefit from their expertise and experience. That said, it pays to know the telltale signs yourself, even in your capacity as a non-professional. Here are the signs that you need to have your flat roof replaced. So, you got another case of the leak for the thousandth time, and you’re mulling over the notion of having it fixed, for the thousandth time. But before doing so, consider the possibility that your roof may have already overstayed its welcome. The average service life of a flat roof, after all, is around 15 years, maybe longer depending on the material or other circumstances. The point is, age is the great equalizer and repair jobs can only take you so far. Why do a repair job if you’re only going to do it again in a year or so? If you feel like your flat roof is already in a geriatric stage, the best course of action is to have it replaced outright. Faulty installation is actually the most common cause of flat roofing issues, especially leaks. If you find yourself calling for a repair job on a regular basis, chances are your flat roof has been incorrectly installed. Professional roofers can fix minor installation issues, but there are some issues that would require an outright replacement. If you suspect that your flat roof has installation issues, it’s recommended that you have it checked by a roofing professional immediately. Let me guess, you’re ready to hire a roofing contractor but you’re at a loss on where to start. You’re not even sure yet if you can draw up a budget to cover the expenses. But fret not. Taking it step by step should alleviate some of the overwhelm. For one thing, getting free quotes from competing contractors should set you on the right path. We’re talking about quotes from screened contractors, meaning you’re going to get a fair deal on top of getting quality service. No obligations, no BS. Just fill out the form and you’ll get your free quotes from competing contractors in no time! Will a Roof Leak with One Shingle Missing? What Causes Black Streaks on Roof Shingles? My Roof is Leaking… What Should I Do? Why Does Black Mold Grow on My Roof? Does Homeowners Insurance Cover Roof, Ceiling & Skylight Leaks?